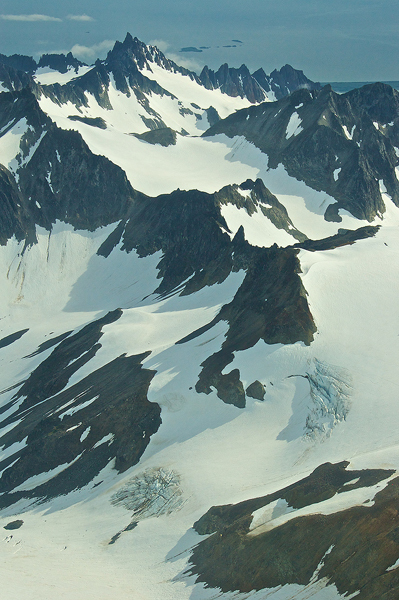 We flew from Denver to Seattle, Seattle to Anchorage and Anchorage to Homer. 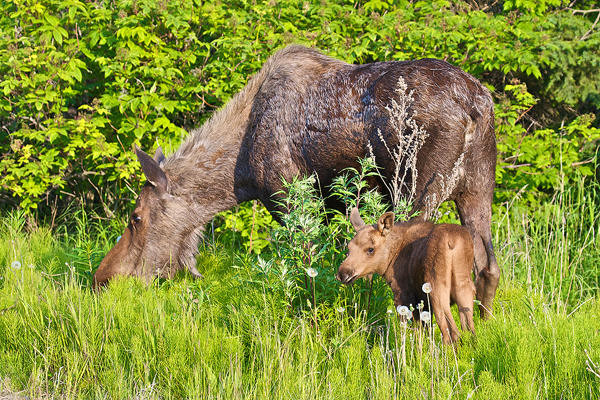 Within probably 20 minutes of getting off the plane we spotted this cow moose and calf grazing on the side of the road. Not a bad start to our trip! 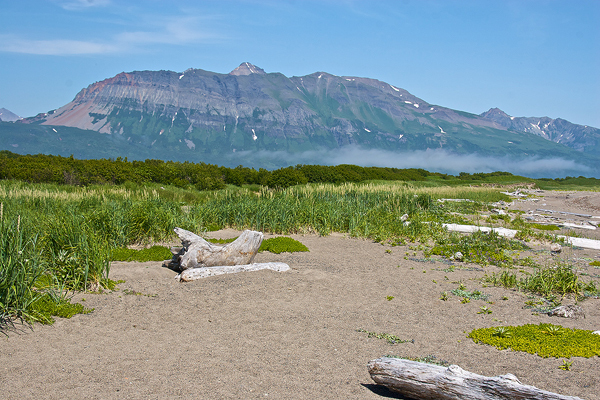 Before and after our trip into Katmai we stayed in Homer, Alaska. 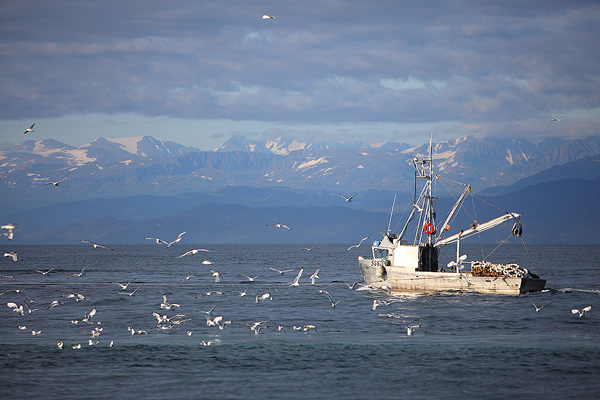 Homer is a beautiful little fishing town located on the Kenai Peninsula. 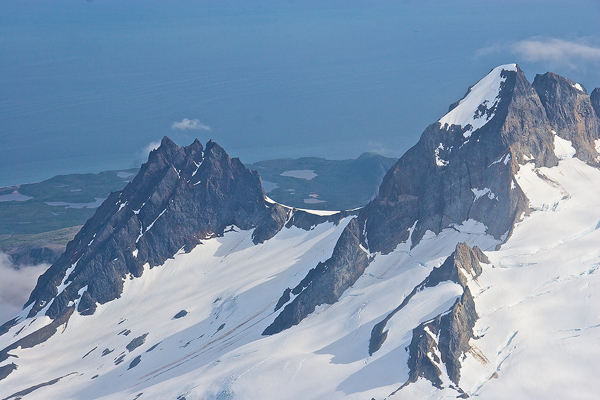 It was beautiful looking across Kachemak Bay towards the Kenai Mountains and their massive glaciers. 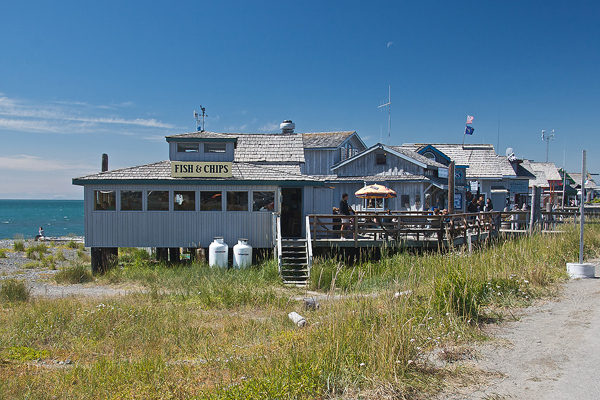 The Homer Spit is the main attraction in homer, this is where we spent most of our time while waiting to head to Katmai. 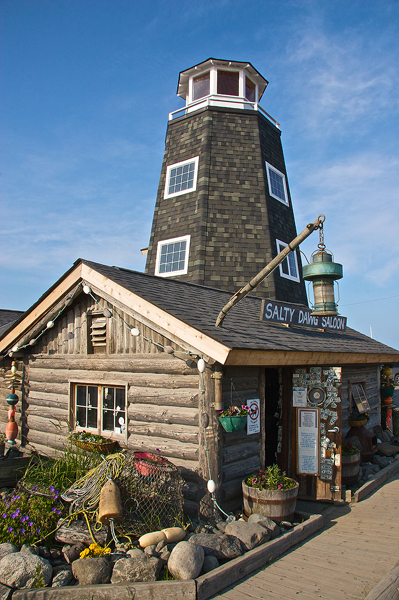 The Salty Dog Saloon is one of Homer's most famous landmarks, and a great place to kill time! It was originally built as a cabin in 1897. Over the years it served many purposes. The building was used as a post office, a railroad station, a grocery store and more. In 1957 it was officially opened as the Salty Dog Saloon. 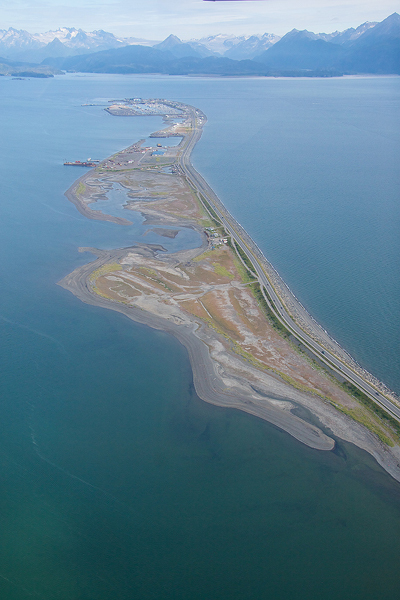 It was eventually moved to its location on the Homer Spit. This bar is famous for the thousands of dollar bills it has signed and tacked to the walls by its patrons. 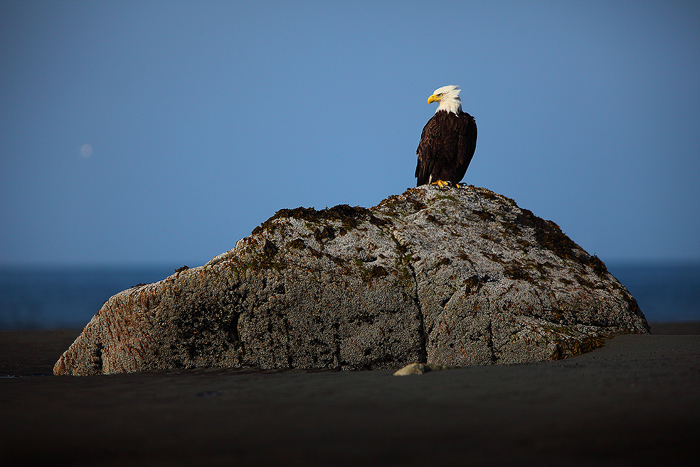 In winter, Homer is one of the best places in the world to see Bald Eagles. 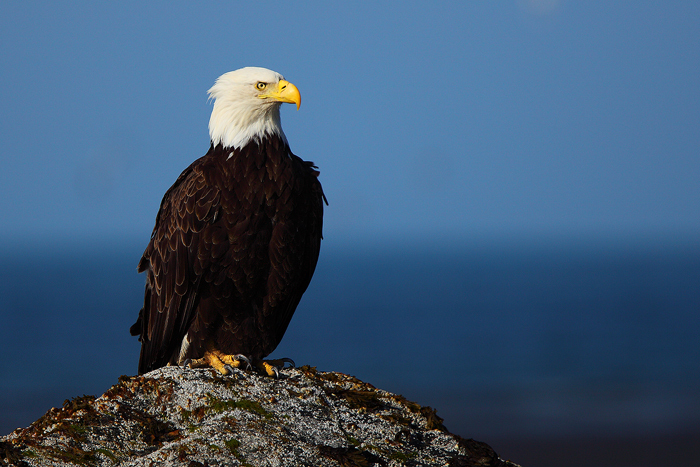 The eagle viewing in the summer wasn't too shabby either. At least by my standards! 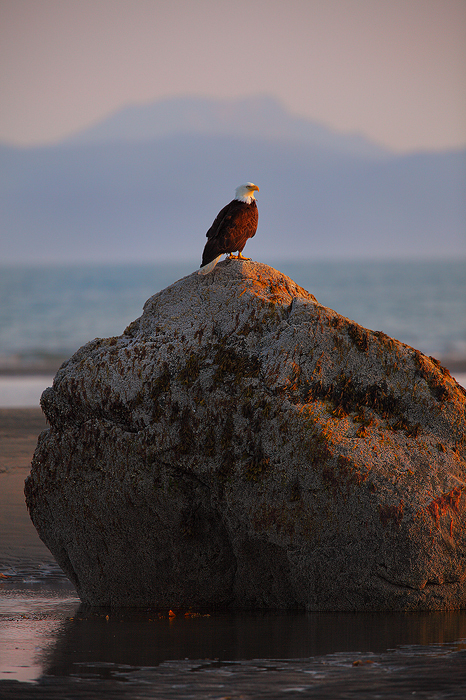 I spent a lot of my time walking the beach at low tide and photographing these beautiful birds. One of the best things about Alaska in the summer is how long the sunset light lasts for. I took this photo of a Bald Eagle at just about midnight. 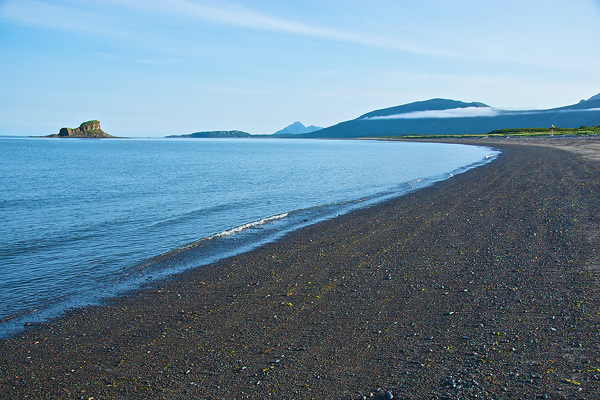 Finally, after a couple days in Homer it was time to head to Katmai! We were disappointed when we got to the air strip to find a major fog bank building over the bay. We were postponed a couple of hours but were luckily eventually cleared for takeoff. 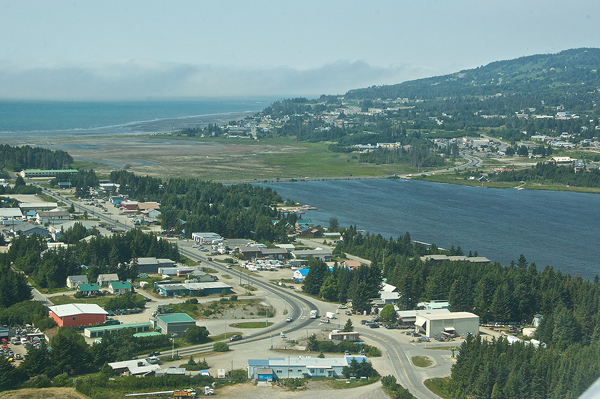 This is the view of Homer from the air as we lifted off in our bush plane. It was a beautiful day out, but if you look in the distance you can see the fog that was lingering over the ocean. 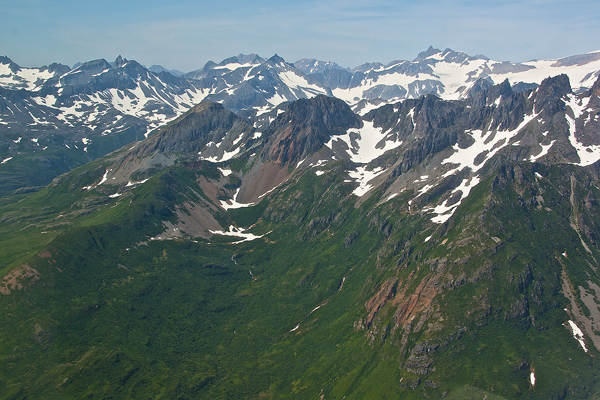 It didn't take long in the plane to realize that this wilderness was the real deal. We were headed to the middle of nowhere. I couldn't have been more excited! 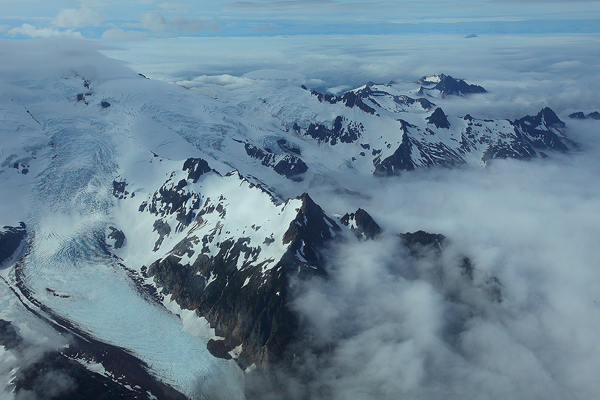 The Flight in and out of Katmai was breath taking. 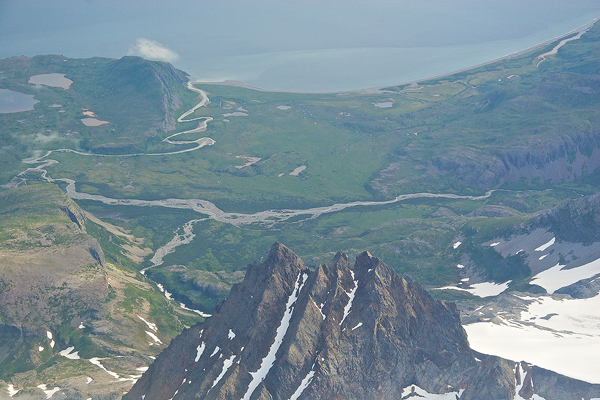 Photos don't accurately capture the scale or ruggedness of the Alaska Peninsula's coastline. 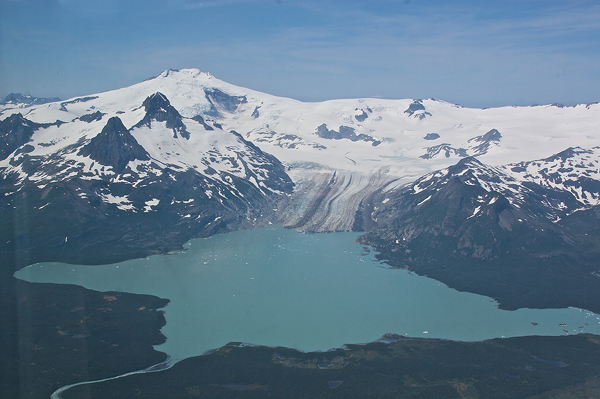 Green mountainsides quickly gave way to massive glaciers and volcanos. 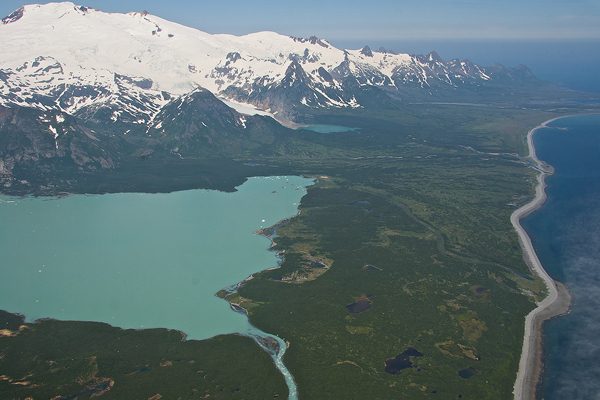 A beautiful glacial lake empties into the sea. 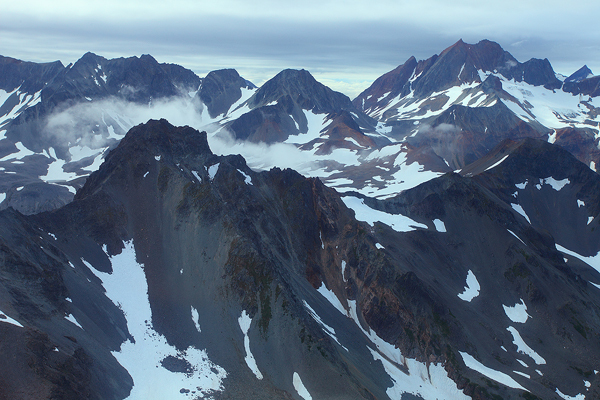 The higher we flew the more beautiful and rugged the landscape got. 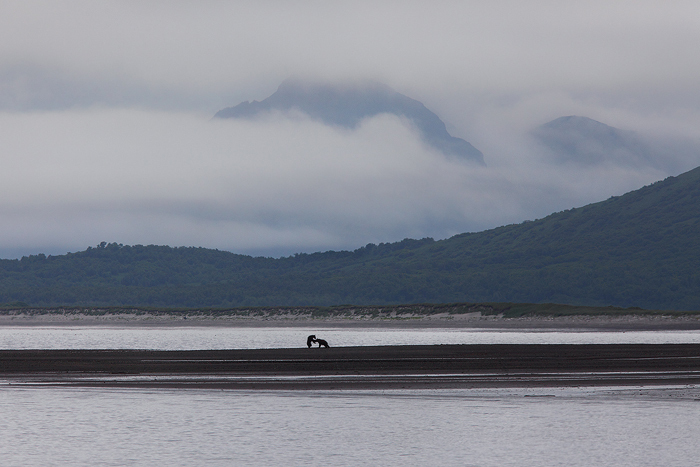 This photo was actually taken on the way back from Katmai when the fog was clearing. Mt. Augustine Volcano can be seen in the far background. 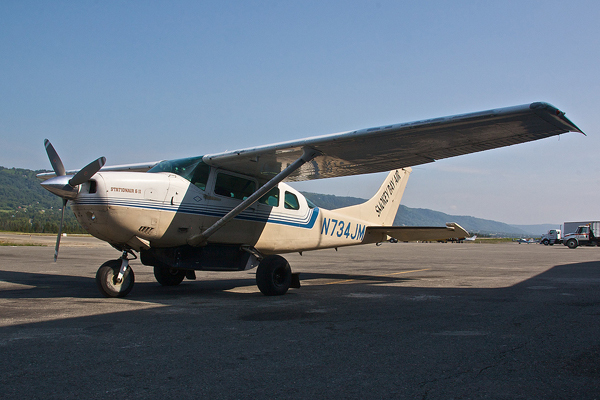 As we began our descent to the beach we were pleased to see the fog had cleared enough for us to land. 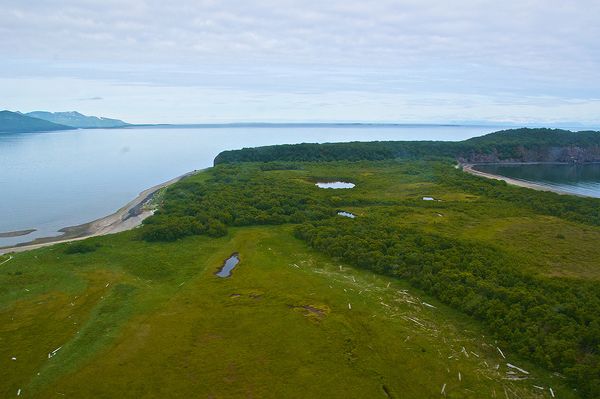 In this picture is the vicinity of the camp, and where we would spend the next four days walking amongst the bears. A view of the meadow we would spend many hours in. At this point in the flight we had already spotted many bears. 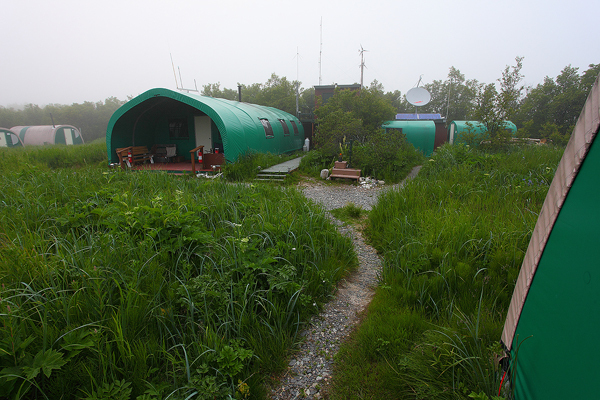 Another shot of the camp vicinity and the two bays we would frequent at low tide. 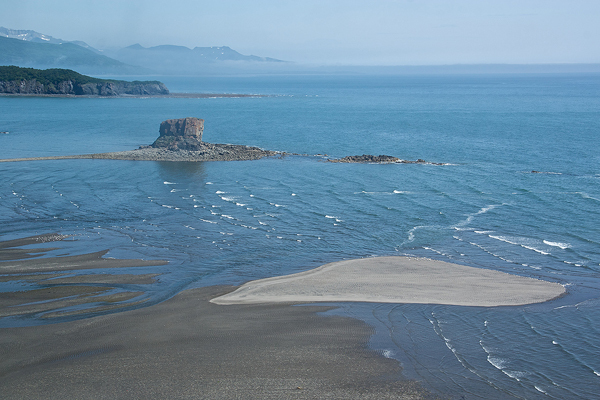 At low tide this bay would be completely emptied of water, offering the bears the opportunity to gorge on clams. Coming around for our final approach to the beach. 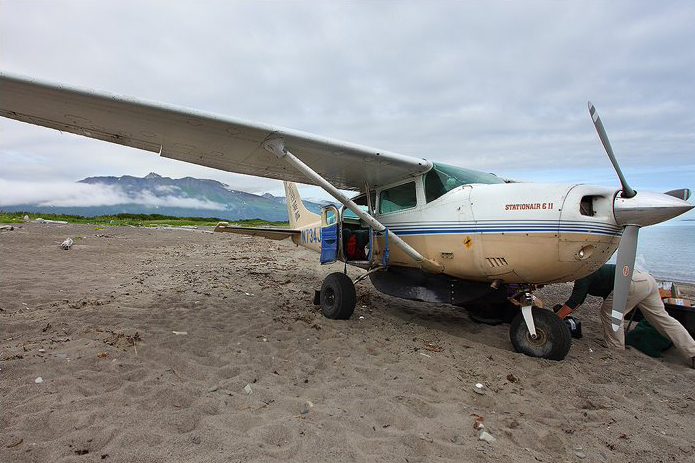 Safely landed on the beach, unloading supplies from the bush plane. 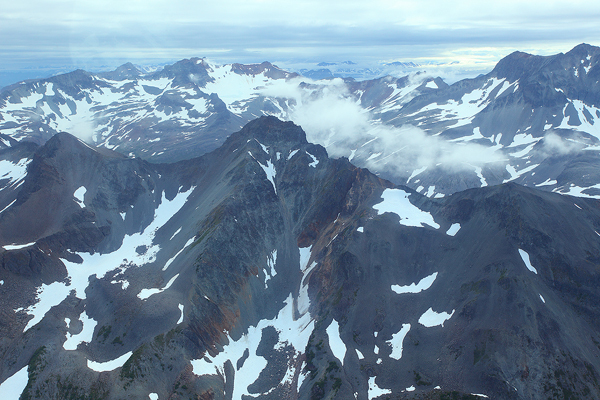 My first look at the rugged wilderness of Katmai from the ground. It's a great feeling knowing you're so far removed from civilization. 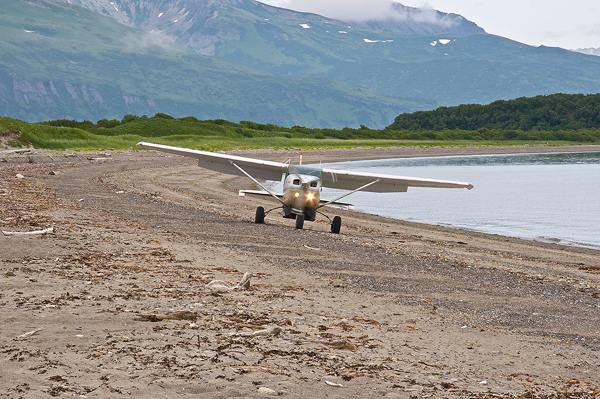 This beach here also serves as the "runway"
A shot of the bush plane taking off after dropping us off. Base Camp: quite and amazing little set up they had here. 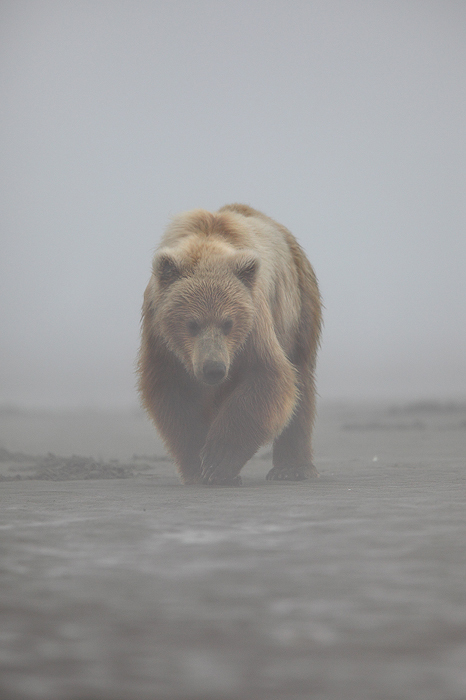 This foggy wet weather is very typical of the Katmai coast. Home sweet home. 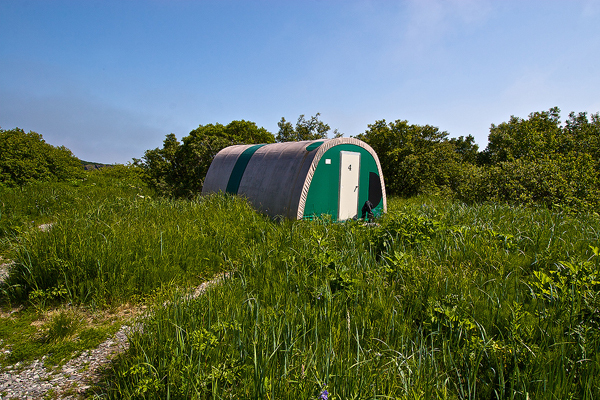 Our tent cabin. 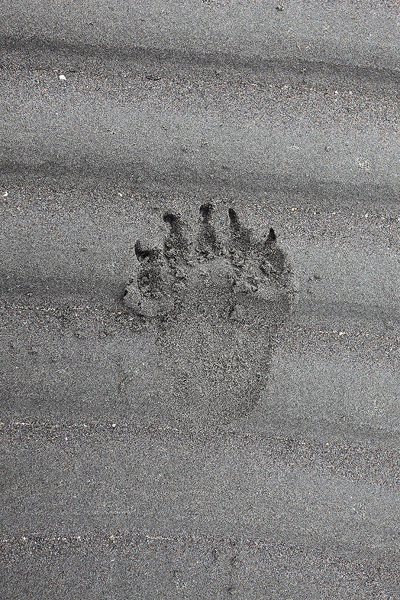 It was not unusual to have a bear come right through camp. We even had one chewing on the corner of our tent at one point. 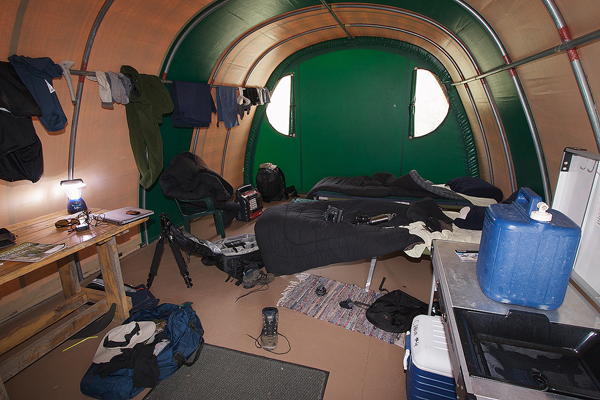 This is an interior shot of our tent cabin. Full of our soaking wet clothes. We attempted to dry things on this trip but the air was so full of moisture it was pretty much impossible. 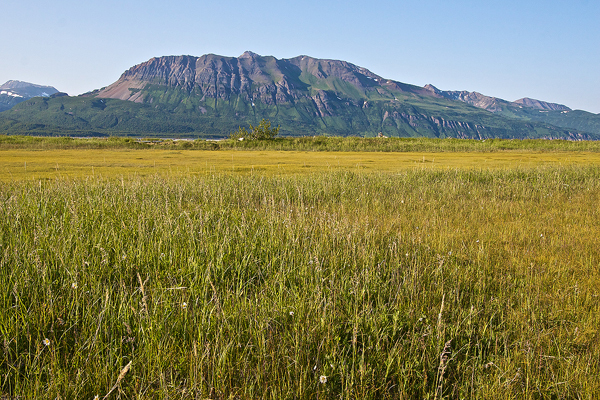 Here is a photo of the typical Katmai landscape taken on one of our only days where we could actually see the mountains. I never got tired of seeing these! 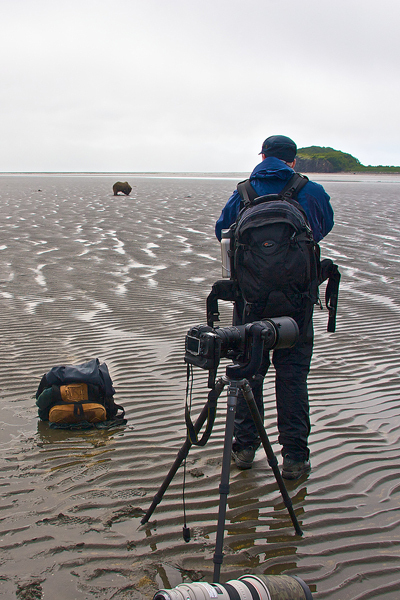 Out on the muddy tidal flats photographing bears. Checking out the scenery on a foggy afternoon. 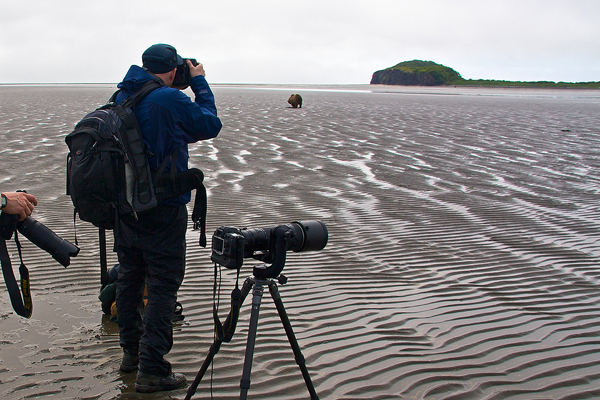 We spent part of one morning photographing a fox digging for clams. 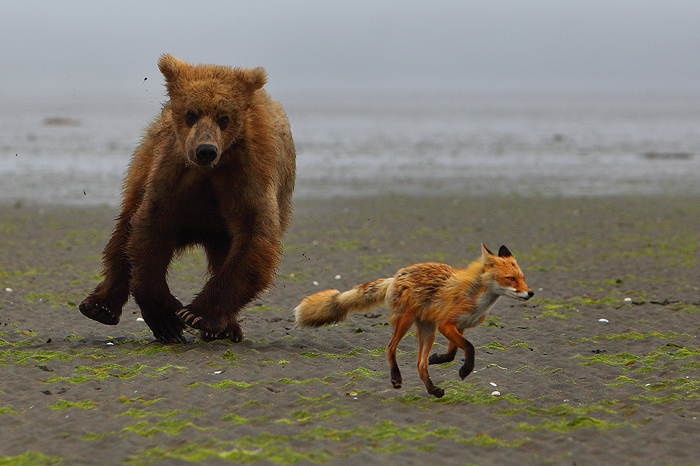 After a while this young brown bear came out of the woods, intent on harassing the fox. It was very entertaining to watch these two very different animals interact. 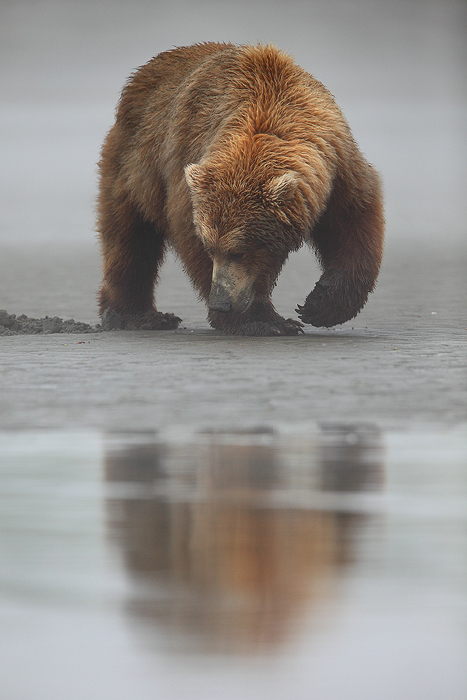 Reflected in the tide, an alaskan brown bear searches for clams. 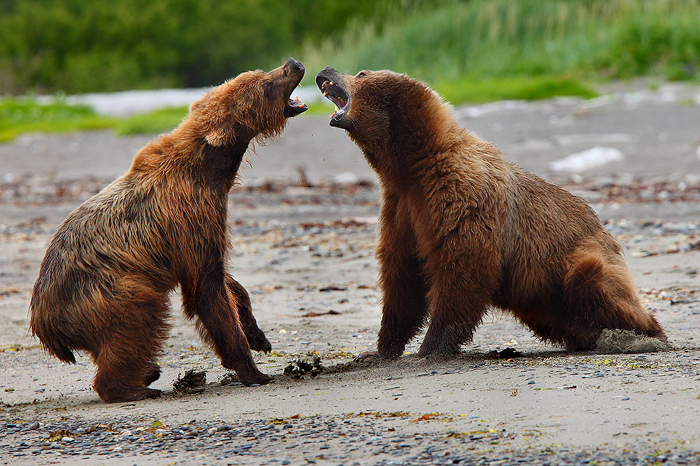 By far the highlight of the trip was when we got to witness two bears engage in a pretty serious battle over a sea otter. The raw power and sounds at such a close range were unreal. 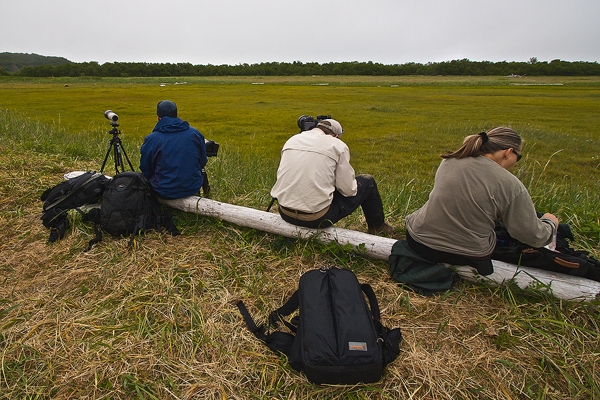 We spent a lot of time on this log waiting for / photographing bears in the meadow. It also served as a great lunch spot! 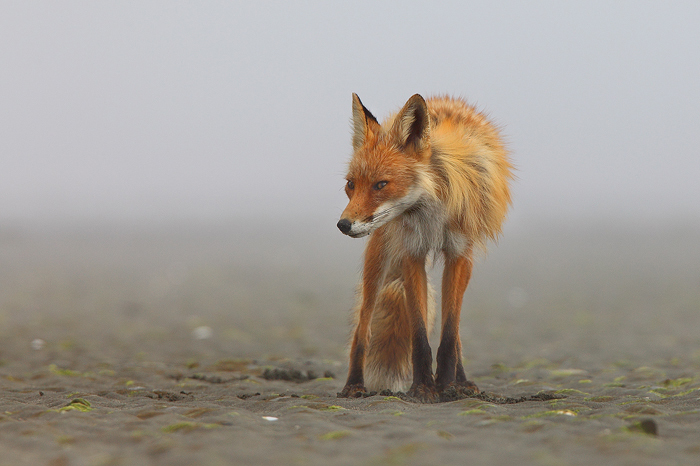 A fox on the tidal flats looking for clams on an extremely foggy morning. In good company. 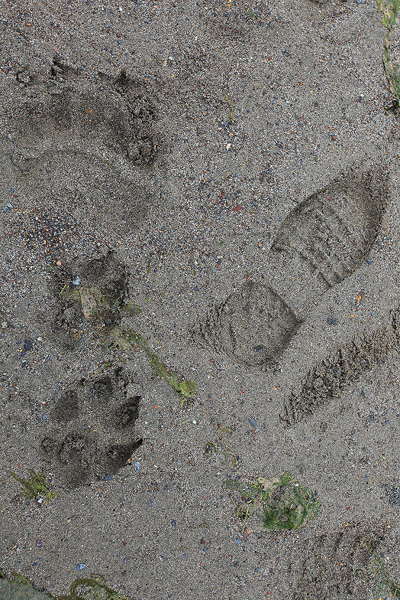 My boot print next to a bear and wolf print. 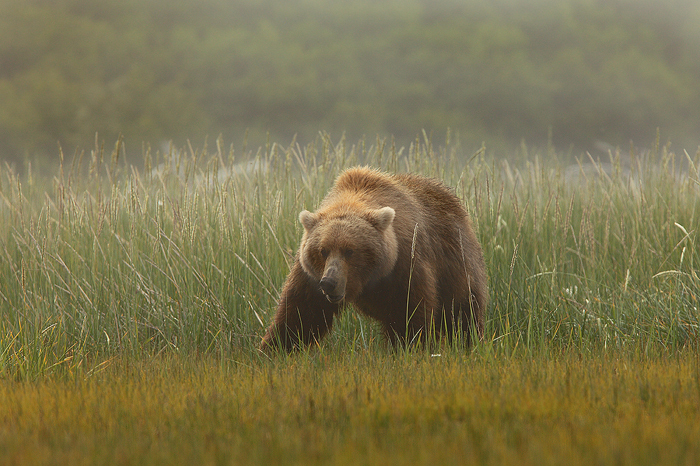 This bear decided to take a seat on the "runway"
A bear emerges from the fog at low tide. 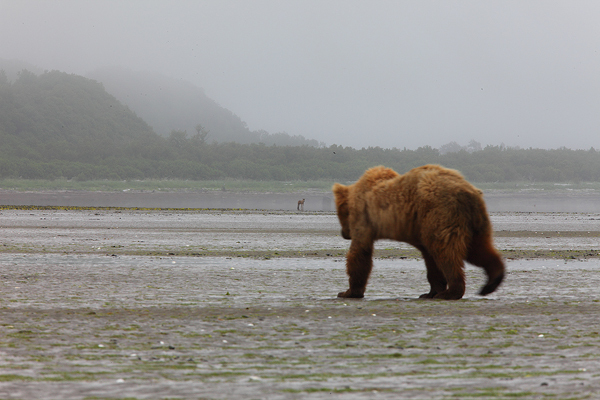 A brown bear walks across the tidal flats looking across the bay at a wolf. After the bear and the fox chased each other around for a bit they had a bit of a staring contest. I just love the expressions on both of their faces. A once in a lifetime photo for sure. As we were headed through the dense trees on a bear trail to get to the meadow this particular morning, we ended up meeting up face to face with a bear. Needless to say we quickly backtracked to the beach and gave him the right of way. We had to wait a while for him to come out of the woods, but it actually turned out great. 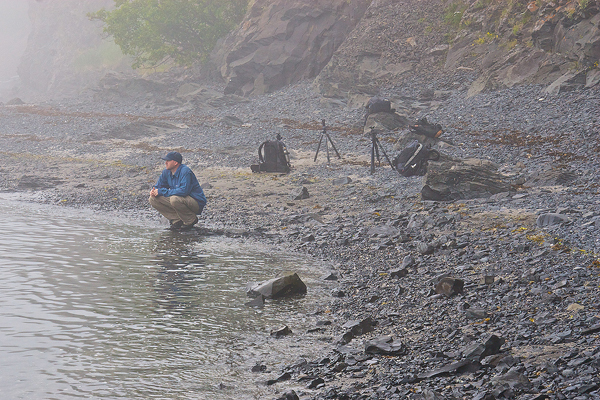 Once he emerged from the alders he headed straight for the shorleline looking for clams, making for some nice atmospheric photos. This particular evening the fog relented just enough to let the sun gently filter through, creating some really amazing conditions for photos. 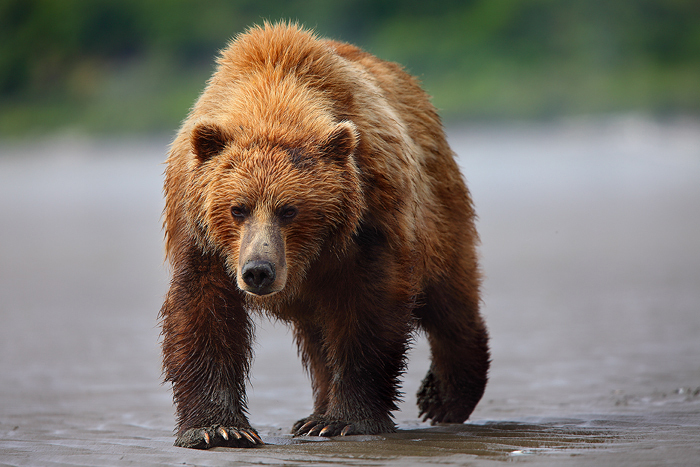 Keeping a safe distance from the bears is very important, but when they decide they want to be where you are there isn't a whole lot you can do about it. This bear ended up getting so close that I wasn't able to achieve focus on it anymore. It's one of my favorite shots from the trip. We were fogged in for an extra day (not that I'm complaining) In the late afternoon the fog finally started to life revealing the mountains for the first time since the first day of the trip. I just loved this scene, with the clearing fog and the two bears play fighting off in the distance. 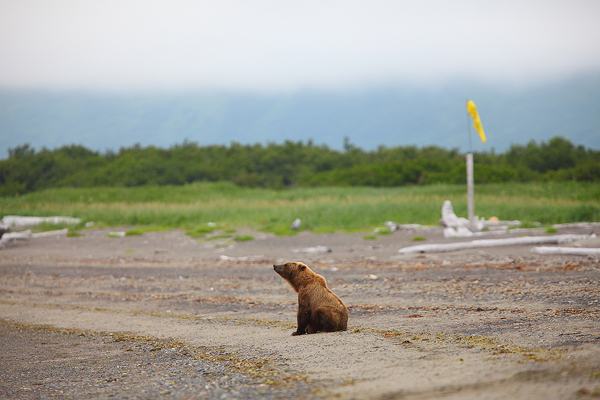 Sadly our time in Katmai had to come to an end... 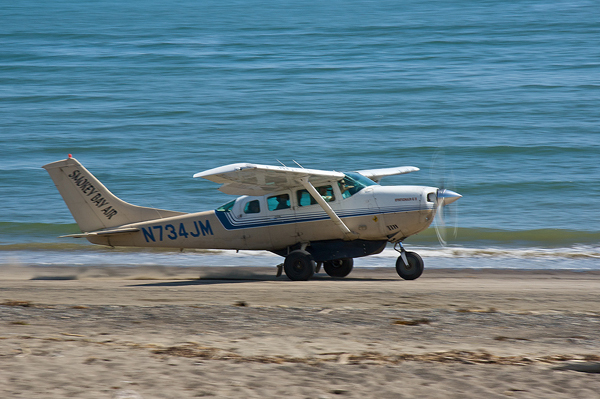 The fog had cleared enough for the bush plane to make it onto the beach and we were soon on our way back to Homer. 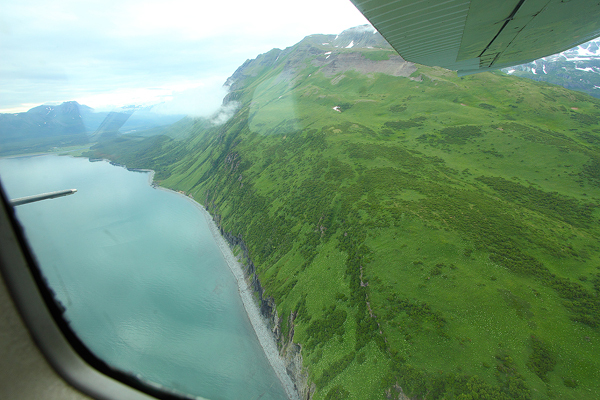 After another beautiful bush plane ride over the mountains of the Alaska Peninsula we arrived back in Homer. 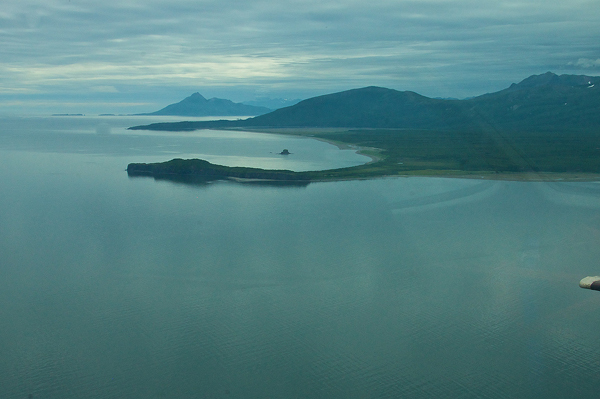 Seen here is the famous Homer Spit from the air with the Kenai Mountains in the background. 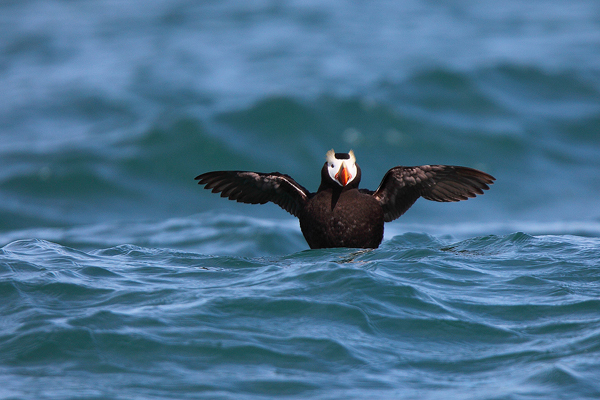 We still had a couple days in Homer before our trip out to Anchorage so we went out onto Kachemak bay hoping to photograph puffins and sea otters. 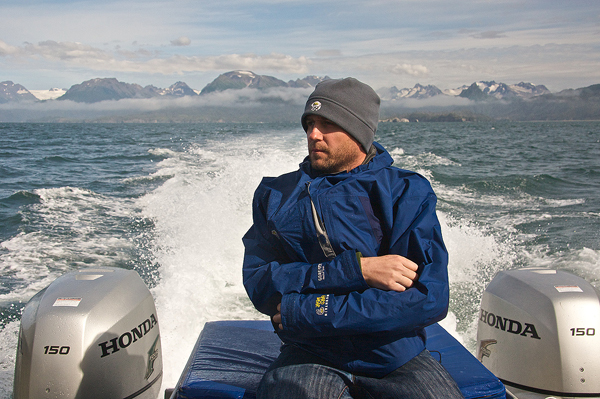 I was pretty cold in this photo, but mostly concerned with keeping my camera dry under my jacket. 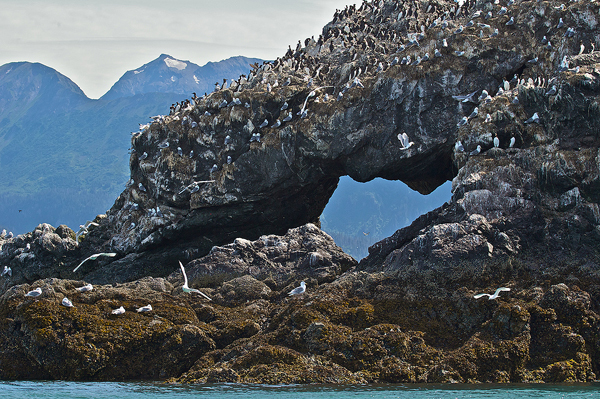 This is Gull Island, an amazing little rookery island on Kachemak Bay. 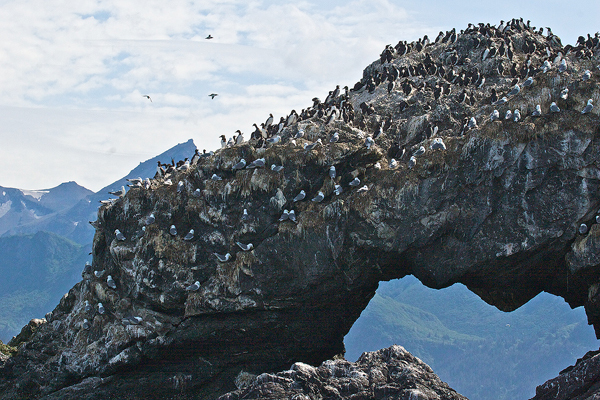 It This is a great place to see puffins, Kittiwakes, Cormorants and many other seabirds. 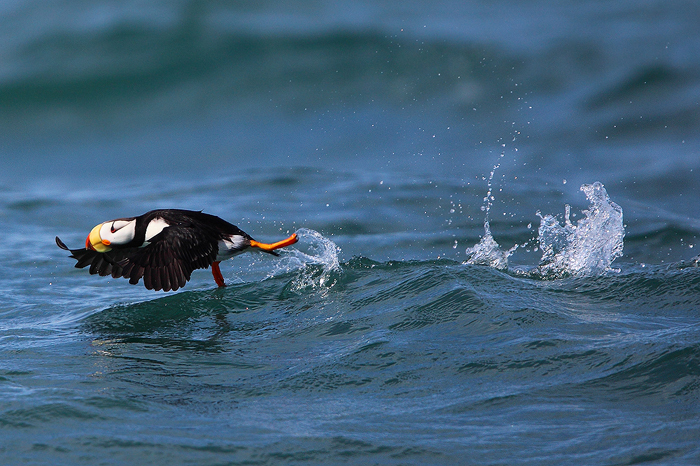 We saw lots of puffins up on the island but unfortunately the waves were really rough this day and it made close up photography pretty much impossible. Very cool to see though. 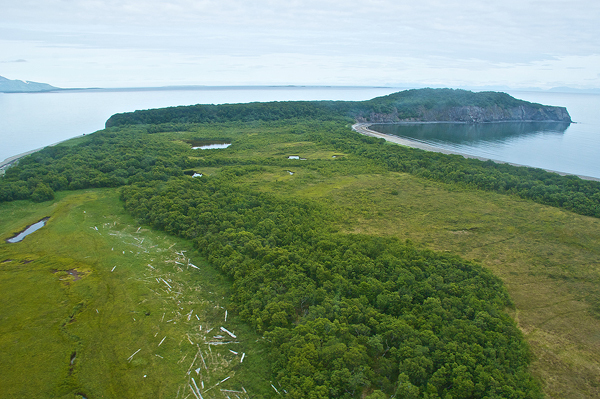 Another shot of the arch on gull island. 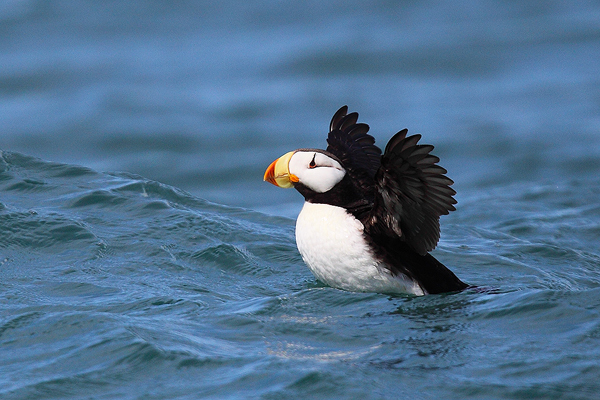 Although the puffins on Gull Island were in a less than ideal location we ended up finding a few Tufted Puffins and Horned Puffins floating out in the bay. This was some of the hardest photography I've done in a while. The waves were rocking our tiny boat which made handholding a large telephoto lens rather difficult. 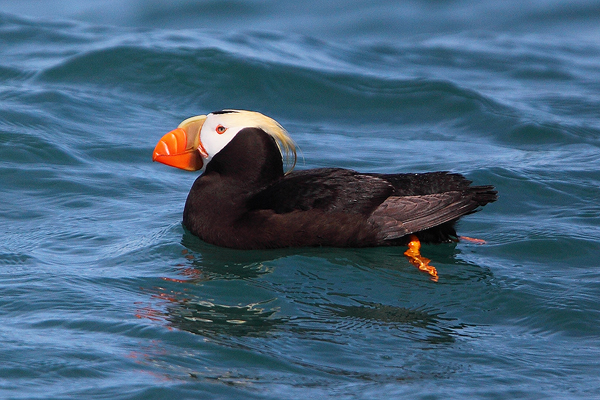 Both the Tufted and Horned Puffins were new species for me so i was ecstatic! 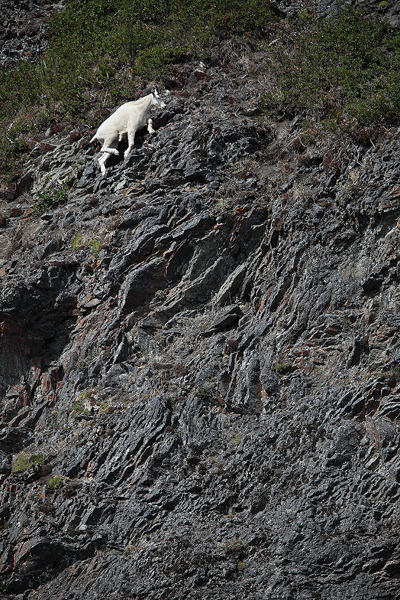 While out on the boat we came across a Mountain Goat doing what Mountain Goats do... hanging around on ridiculously steep cliffs. 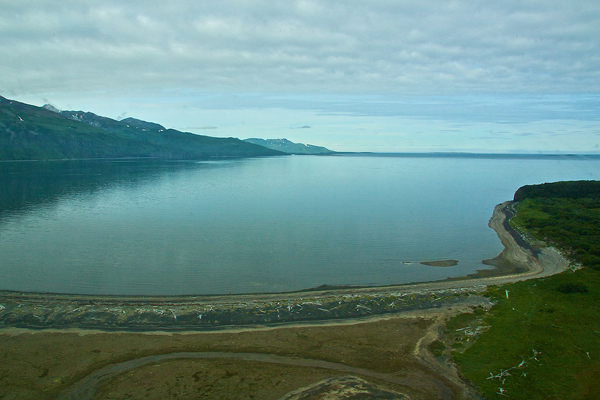 On our final night in homer we decided to head up to higher ground overlooking the bay, hoping to get some landscape photos. 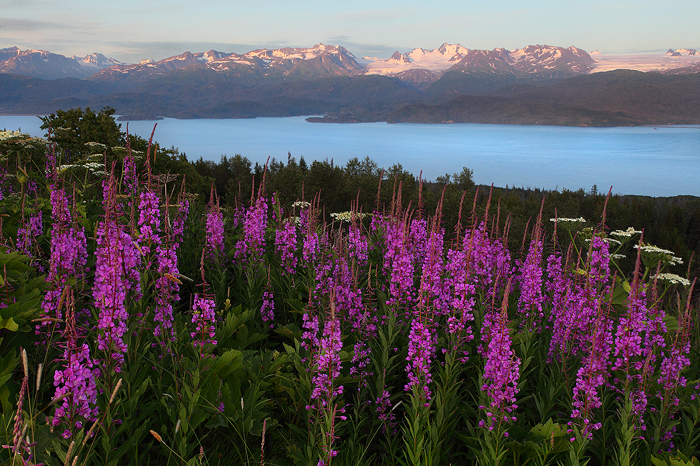 The fireweed was in full bloom and the sunset light was amazing. It's a weird thing, taking a sunset photo at 11pm. We went straight from here to the airport and started our trip home. This was an amazing trip with countless memories and I can't wait to go back!